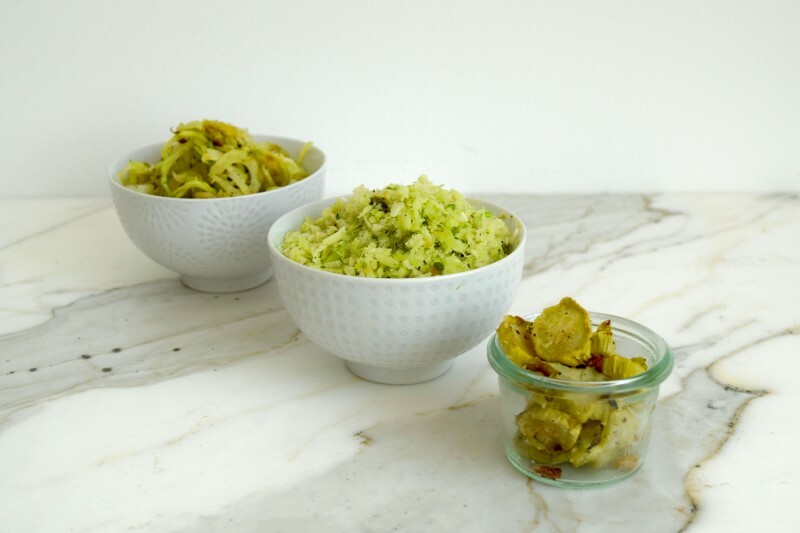 Save your broccoli stalks: here are 3 delicious recipes for them. Don’t throw away your broccoli stalks! They are absolutely delicious, and I’ve got three quick and easy broccoli stem recipes for you. Growing up, my mom would always toss the broccoli stalks, so I just assumed they were inedible or not tasty. I was wrong! In researching for my book, The Real Food Grocery Guide, I realized not only can you eat broccoli stems, but they are so good I’d rather eat the stem first then figure out what to do with the florets. (I’ll be using broccoli stalk and broccoli stem interchangeably in this article…they’re the same thing!). Ounce for once, broccoli stalks and broccoli florets provide about the same amount of many key nutrients, including Vitamin C, potassium, B vitamins, calcium, and iron. The main differences are that the stalks contain more fiber, while the florets contain more Vitamin A and sulforaphane, a compound that helps protect against cancer. So eat both parts! I made a quick video tutorial to show you how to cook with broccoli stalks. The recipes are super simple, and I’ve included them below the video. These are not quite crisp and crunchy like chips, but they are just as crave-worthy. Coated in almond flour and pink salt these will disappear quickly. I usually make these at the same time I’m making roasted broccoli florets, and this is indeed pretty similar to my Best Roasted Broccoli Recipe – The only difference is I wanted to test using a lower temperature (350F instead of 400F,) as I only had extra virgin olive oil on hand, which has a lower smoke point. When cooking with oils, never heat an oil above it’s smoke point (literally the temperature at which it smokes – you may have seen this happen if you ever forgot a pan of oil on the stove top). Extra virgin olive oil has a low smoke point (in the appx. 325F-375F range), while virgin olive oil can withstand slightly higher temperatures (up to about 425F). So, I advise my clients to use extra virgin olive oil mostly for raw preparations or low temperature cooking, and virgin olive oil for low-medium temperature cooking. For a more in-depth explanation of oils, and the best (and worst) oils for each cooking method, check out my book, The Real Food Grocery Guide. Cut the broccoli stalk into ¼ - inch slices. Put in a bowl and set aside. Chop the garlic and add it to the broccoli stems. Add a drizzle of olive oil, and a pinch of pink salt and black pepper. Use your hands or spoons to mix everything and evenly coat the chips. Lay the chips flat on a baking sheet. 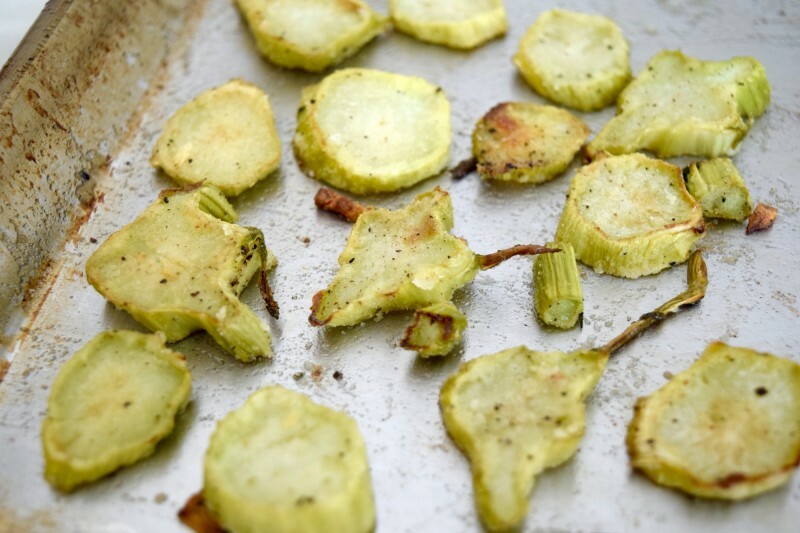 Remove from the oven, sprinkle almond flour on top, and use two spoons to flip the chips so that they’re all coated. Pop back into the oven for another 10 minutes. Remove from the oven, let cool a couple minutes before serving. Add additional salt and pepper, to taste, if needed. I often say that simply chopping vegetables differently makes them feel like an entirely different food. This broccoli rice is a case in point. 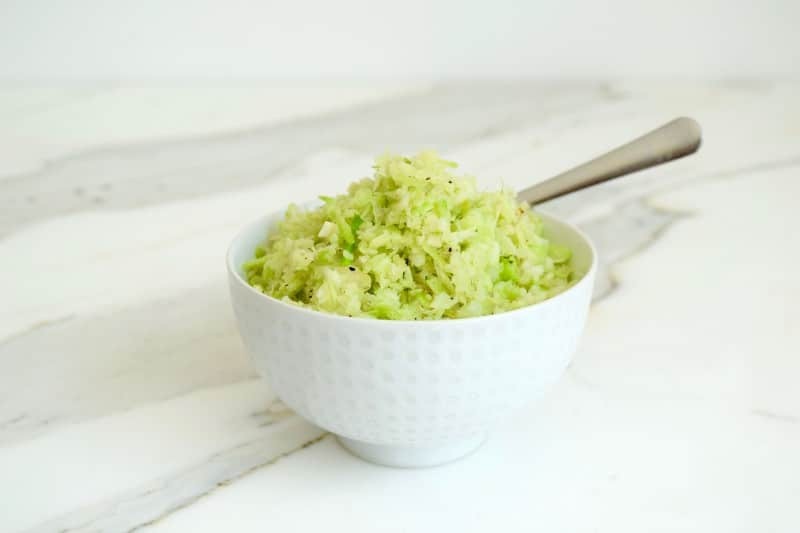 While you can also “rice” the florets, I find there is never a lack of broccoli floret recipes, and it’s often the stem that is left over and will usually find it’s way into the garbage can. But, not anymore! Simply chop the stems and pop them in the blender or food processor to create a rice like texture. You can then either water saute or saute with garlic and olive oil (and chiles, perhaps), for a fun and colorful side dish. 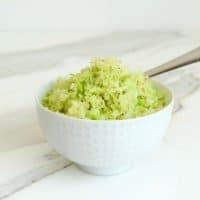 This goes well with salmon or fish in general, and personally, I love sauteeing this with onions and chiles, then adding eggs to create a flavorful broccoli scramble. Chop the stalk into ¼ - inch thick pieces, and add to a food processor or blender. (If using a high speed blender, process on low speed up to 4). Pulse or blend the broccoli stem pieces until a rice-like texture is achieved. On the stove, heat a pan over medium heat then add a drizzle of oil to coat the bottom of the pan. Add the garlic and chile pepper (if using). Cook for 30-60 seconds, until fragrant, then add the broccoli rice and use a spoon to lay out evenly in the pan. Add water, and a pinch of pink salt and black pepper, stir once, then let saute for 5-7 minutes, stirring occasionally, until broccoli rice is soft. Taste, and add salt and pepper as needed, before serving. Broccoli stem noodles are incredibly good. Now, I love spiralized veggies, but these broccoli stem noodles? Next level. 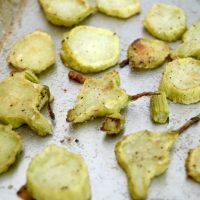 They are the perfect texture – they actually hold up like al dente pasta – and are refreshingly savory (I find myself spirlizing a lot of zucchini – which I find too watery and soft when cooked – and sweet root veggies, like beets, carrots, and sweet potatoes, so this was a welcome change). It makes me want to go to the grocery store and buy all the stems that the produce manager probably threw in the garbage while arranging a display of “broccoli crowns”. 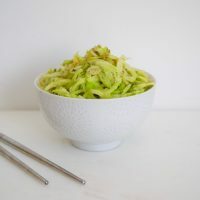 These broccoli stem noodles would also go so well with typical Asian sauces or flavors, like sesame, soy sauce, ginger, and scallions, too. 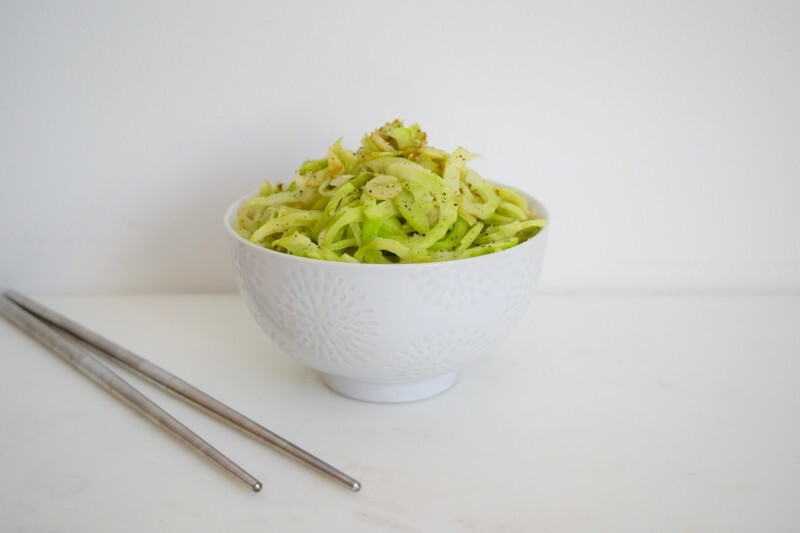 Spiralize broccoli into thick noodle-like strands. In a pan on medium/low heat, add enough olive oil to cover the bottom of the pan. Add chopped garlic and cook for 30-60 seconds before adding broccoli noodles. Add water, pink salt, and black pepper. Stir well. Cook for 7 minutes, stirring occasionally, and adding more water, 1 tablespoon at a time, as needed, to prevent sticking to the pan. When the noodles are soft, yet firm, remove to a bowl. Taste, and season with additional salt and pepper, as needed.